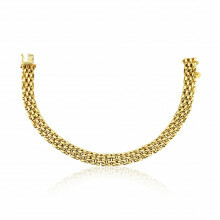 A Yellow Gold Bracelet with Wow factor. Each of the long oval links is joined to the next by a row of three round links stacked on top of one another. Bold, beautiful and a real statement piece, it has a textured finish and a secure box clasp. Makes a fabulous and impressive gift.